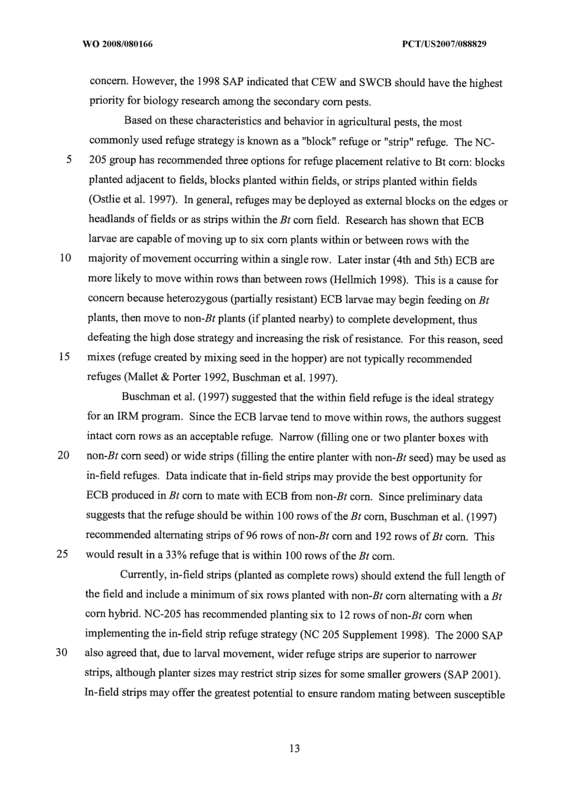 Insect refuge strategies are described for the management of insect resistance development. 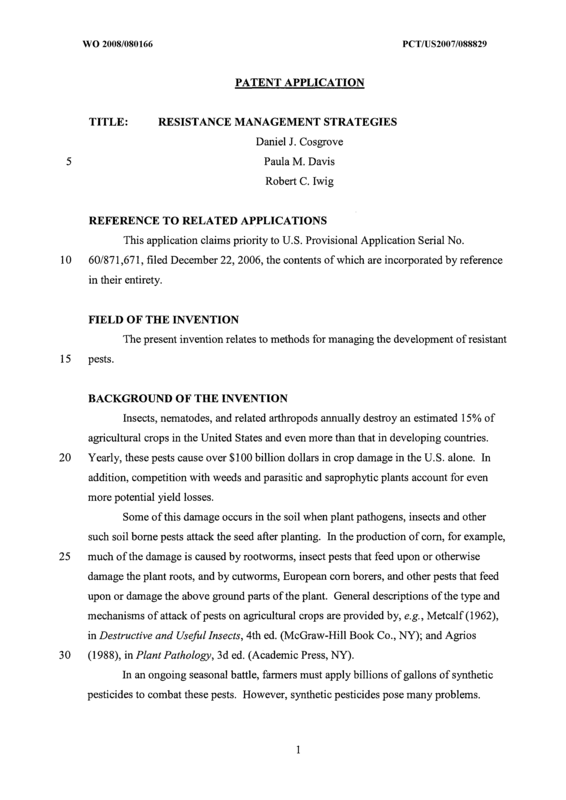 The present invention relates generally to the control of pests that cause damage to crop plants, and in particular to corn plants, by their feeding activities directed to root damage, and more particularly to the control of such plant pests by exposing target pests to seeds or mixtures of seeds having multiple different modes of action. 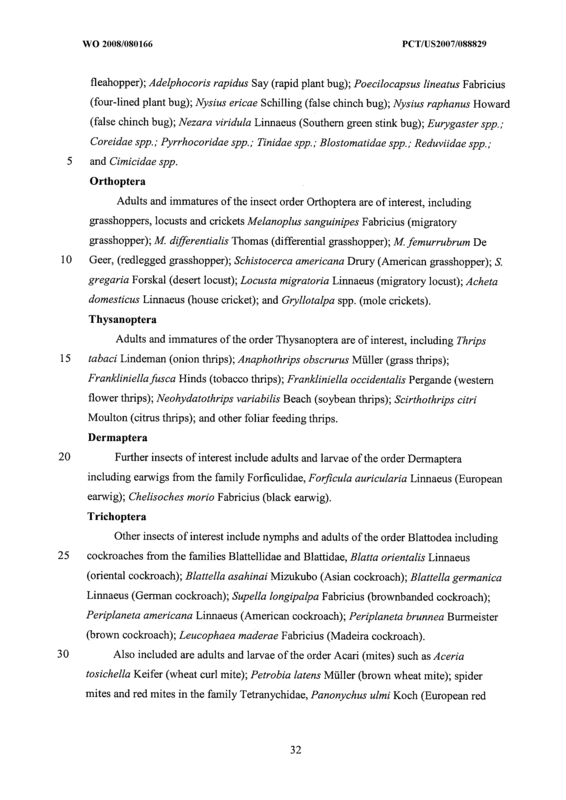 The first one or more transgenes and the second one or more transgenes are each, respectively, insecticidal to the same target insect but have different modes of action, and bind either semi-competitively or non-competitively to different binding sites in the target pest. 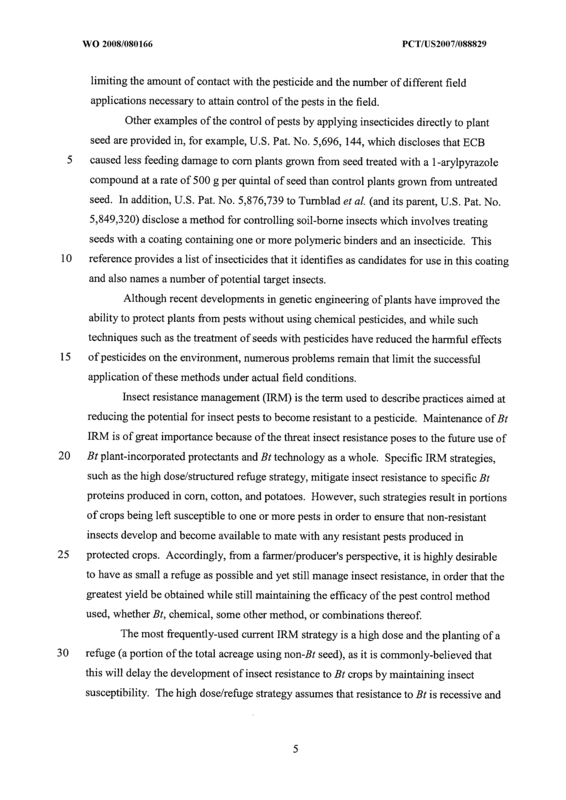 In addition, the treatment of such seed with a chemical or peptide-associated pesticide prior to planting the seed is also disclosed. 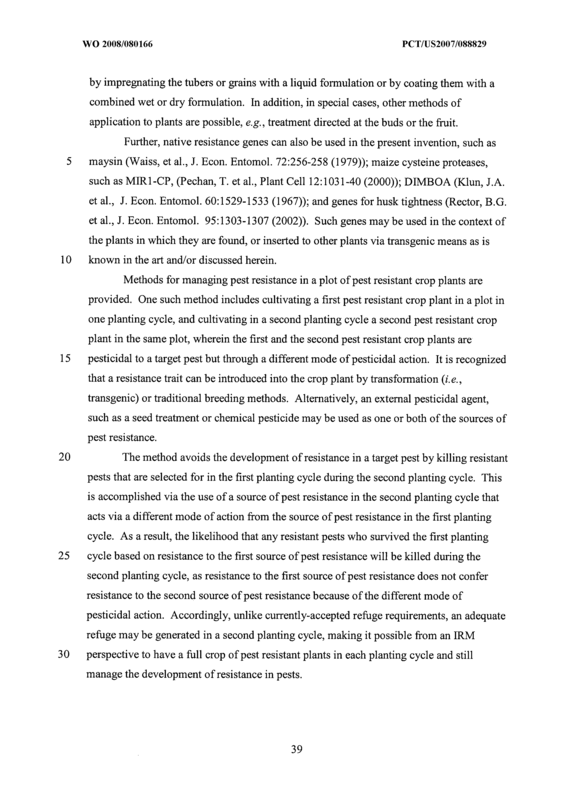 A method of reducing the development of resistant pests in a field of transgenic pest resistant crops comprising the steps of: a) mixing seed of a first transgenic pest resistant crop with seed of a second transgenic pest resistant crop to provide a seed mixture wherein said first pest resistant crop and said second pest resistant crop are pesticidal to the same target pest but through a different mode of pesticidal action, wherein said seed mixture consists of from about 99% to about 1 % of said first transgenic pest resistant crop and of from about 1% to about 99% of said second transgenic pest resistant crop; and b) planting said seed mixture. 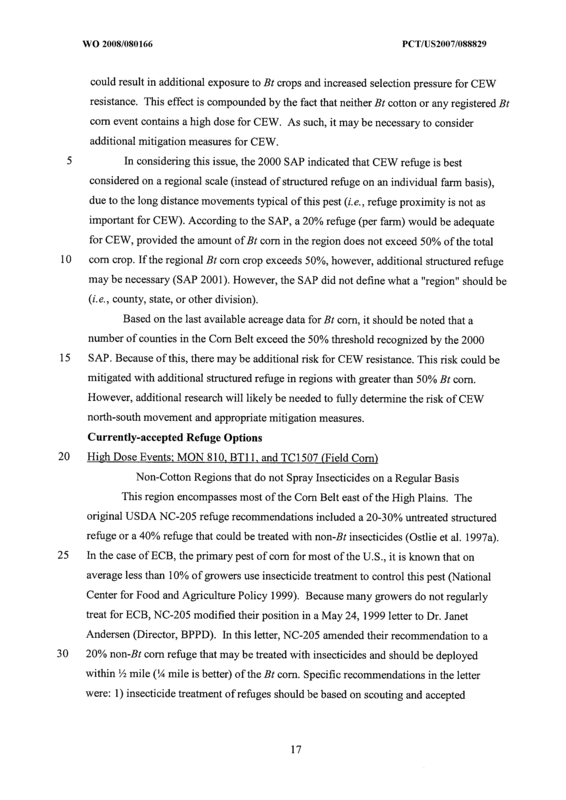 The method of claim 1, wherein said pest is selected from the group consisting of: western corn rootworm, northern corn rootworm, Mexican corn rootworm, southern corn rootworm, and combinations thereof. 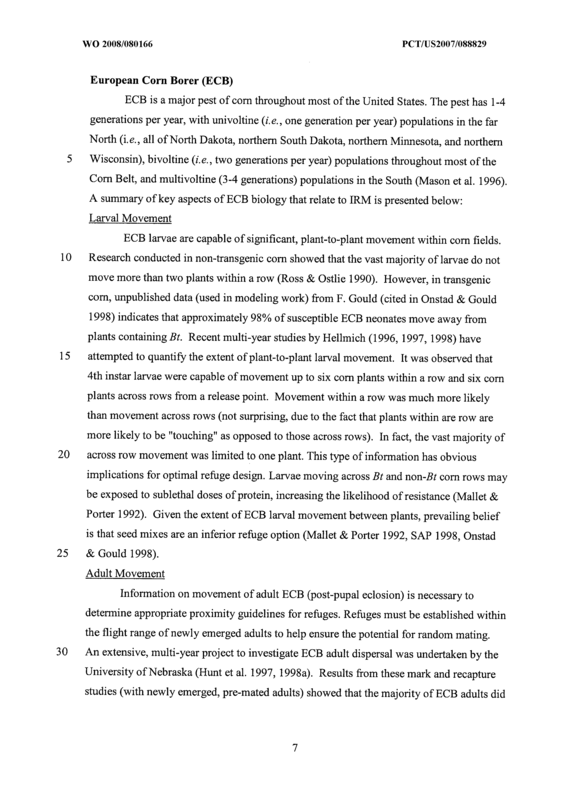 The method of claim 1, wherein said pest is western corn rootworm. 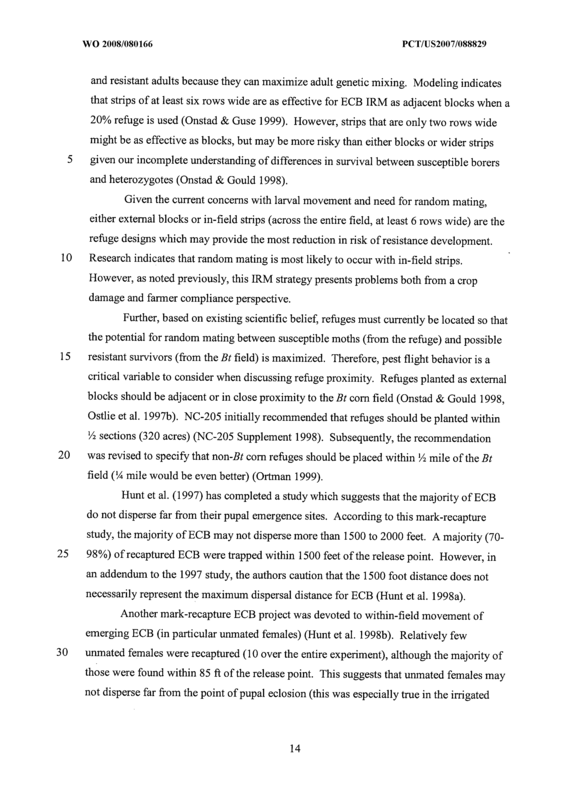 The method of claim 1, wherein said different mode of pesticidal action comprises binding semi-competitively or non-competitively in the gut membrane of said same target pest. 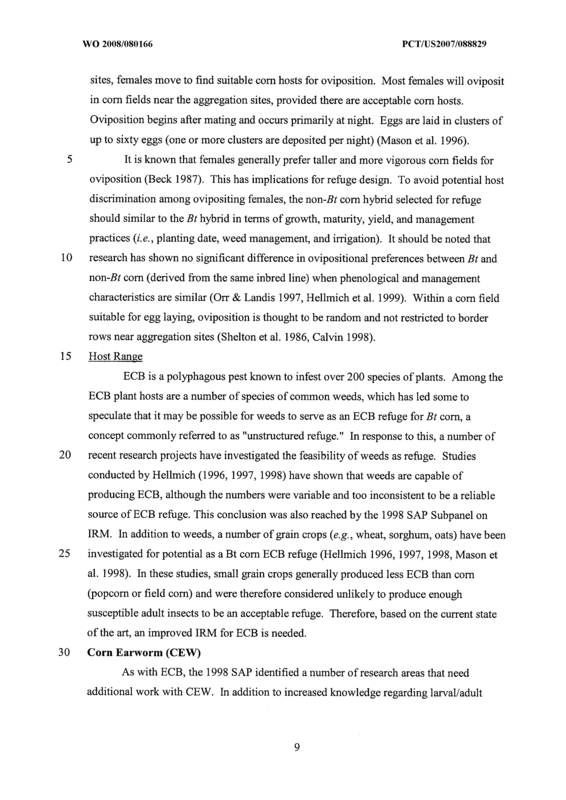 The method of claim 1 further comprising treating said first transgenic pest resistant crop seed and/or said second transgenic pest resistant crop seed with a pesticidal agent. 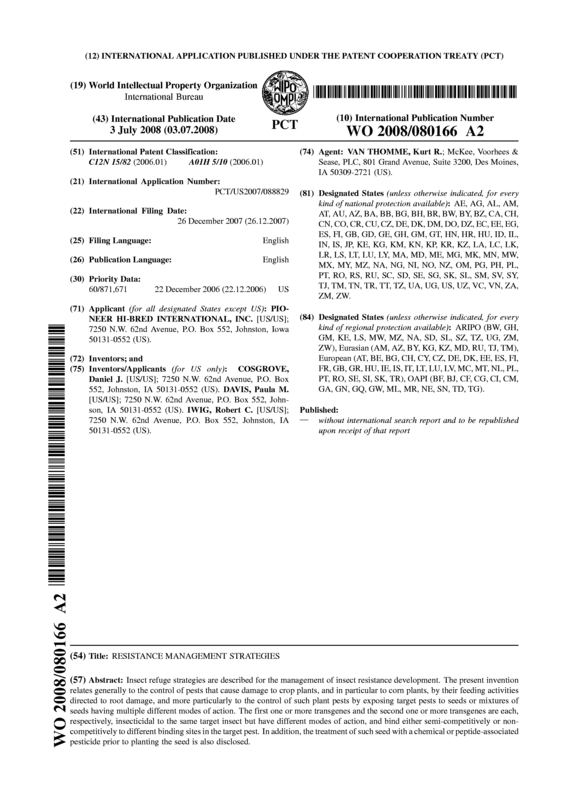 The method of claim 5, wherein said pesticidal agent is selected from the group consisting of: an insecticide, an acaricide, a nematicide, a fungicide, a bactericide, a herbicide, or a combination thereof. 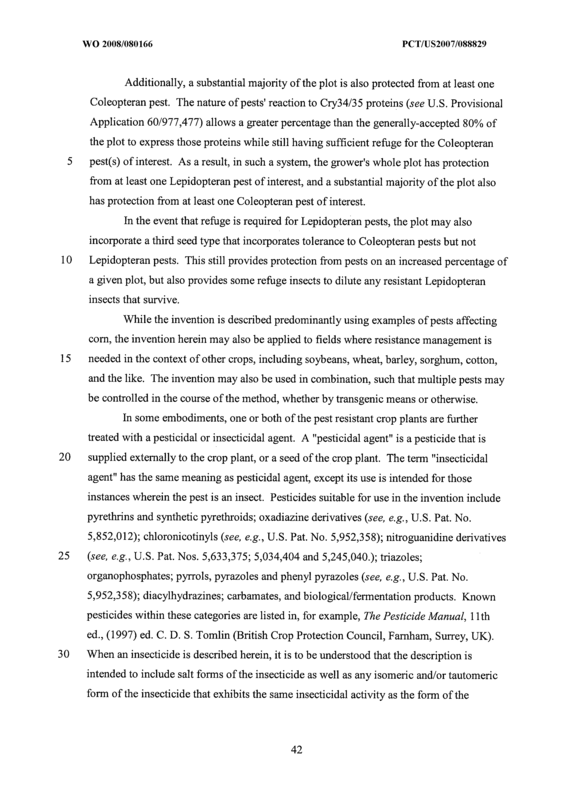 The method of claim 6, wherein said pesticidal agent is an insecticide. 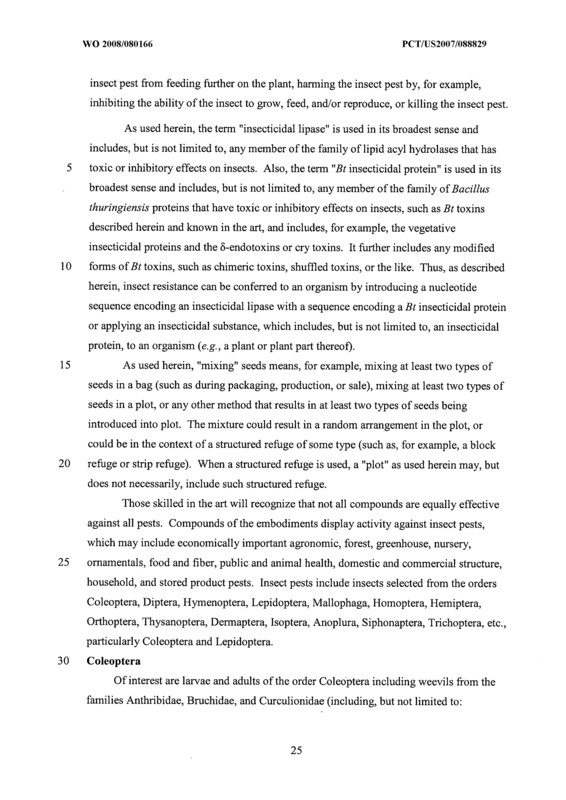 The method of claim 7, wherein said insecticide is selected from the group consisting of: a pyrethrin, a synthetic pyrethrin, an oxadizine, a chloronicotinyl, a nitroguanidine, a triazole, an organophosphate, a pyrrol, a pyrazole, a phenol pyrazole, a diacylhydrazine, a biological/fermentation product, a carbamate, or a combination thereof. The method of claim 1 , wherein said first transgenic pest resistant crop plant produces Cry34/35 proteins and said second transgenic pest resistant crop plant produces a Cry3 protein. The method of claim 1 , wherein said first transgenic pest resistant crop plant produces Cry34/35 proteins and said second transgenic pest resistant crop plant produces a Cry IF protein. 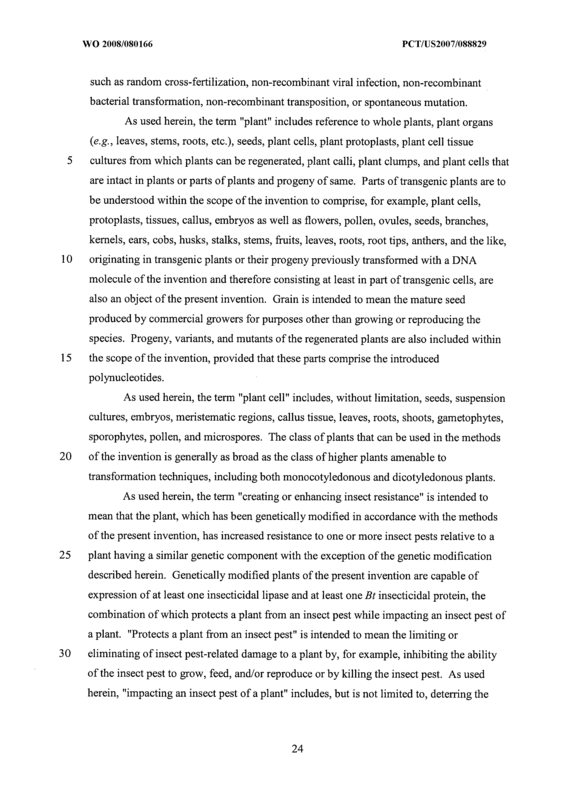 The method of claim 1 , wherein said first transgenic pest resistant crop plant produces a Cryl A(b) protein and said second transgenic pest resistant crop plant produces a Cry IF protein. 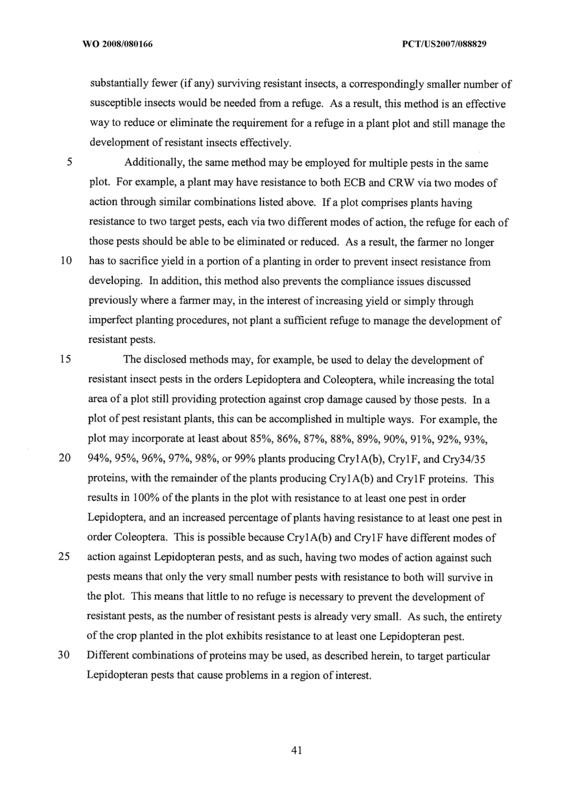 The method of claim 1 , wherein said first transgenic pest resistant crop plant produces a Cryl A(b) protein and said second transgenic pest resistant crop plant produces a Cry9 protein. 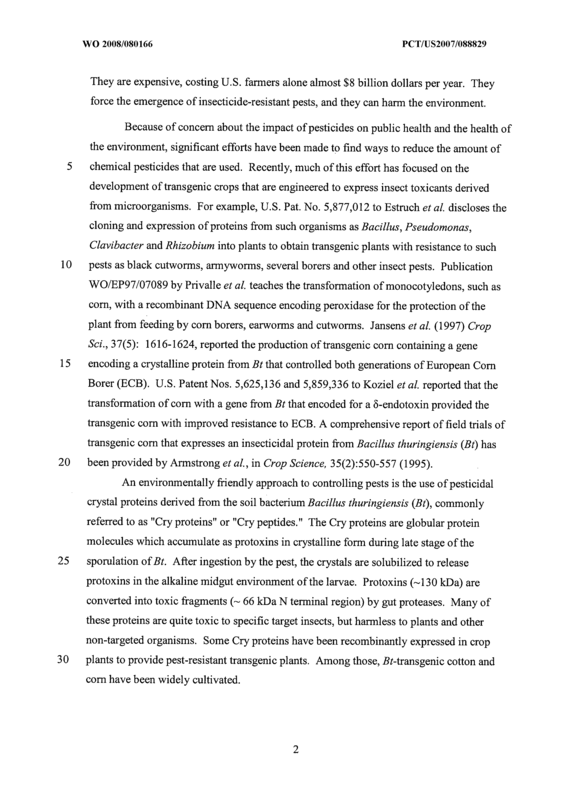 The method of claim 1 , wherein said first transgenic pest resistant crop plant produces a Cryl A(b) protein and said second transgenic pest resistant crop plant produces a Cry2 protein. 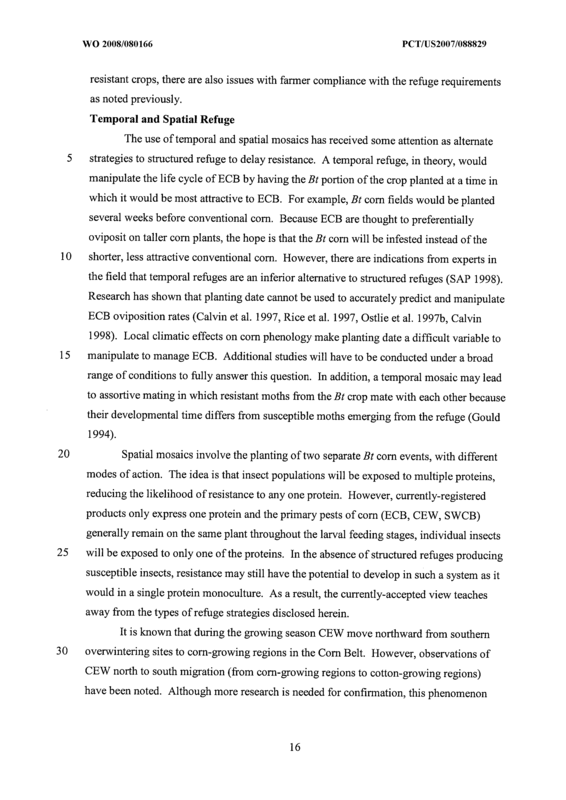 The method of claim 1 , wherein said first transgenic pest resistant crop plant produces a Cryl F protein and said second transgenic pest resistant crop plant produces a Cry2 protein. 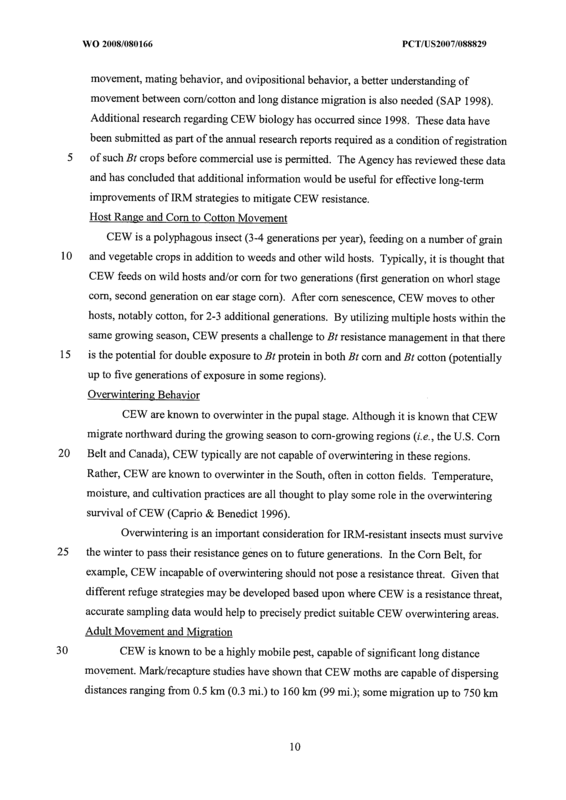 The method of claim 1 , wherein said first transgenic pest resistant crop plant produces a Cryl A(b) protein and said second transgenic pest resistant crop plant produces a Cry2 protein and a Vip3A protein. 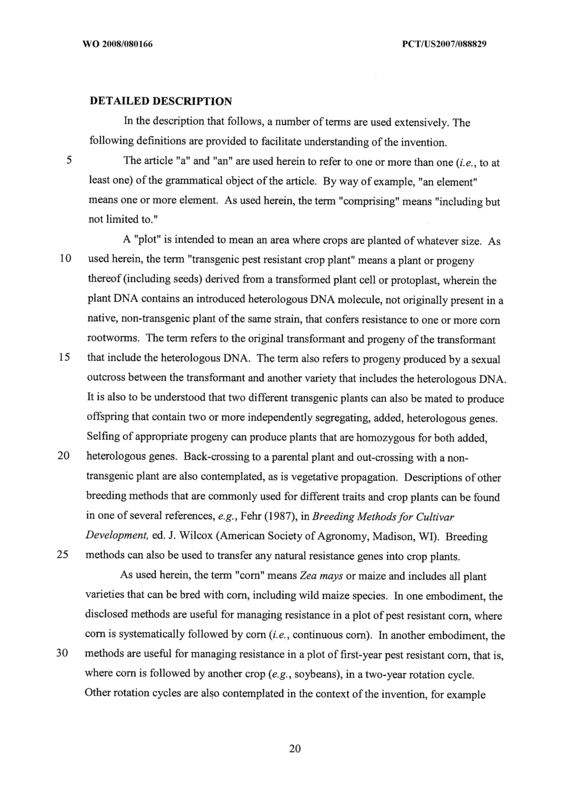 The method of claim 1 , wherein said first transgenic pest resistant crop plant produces a Cry IF protein and said second transgenic pest resistant crop plant produces a Cry2 protein and a Vip3A protein. 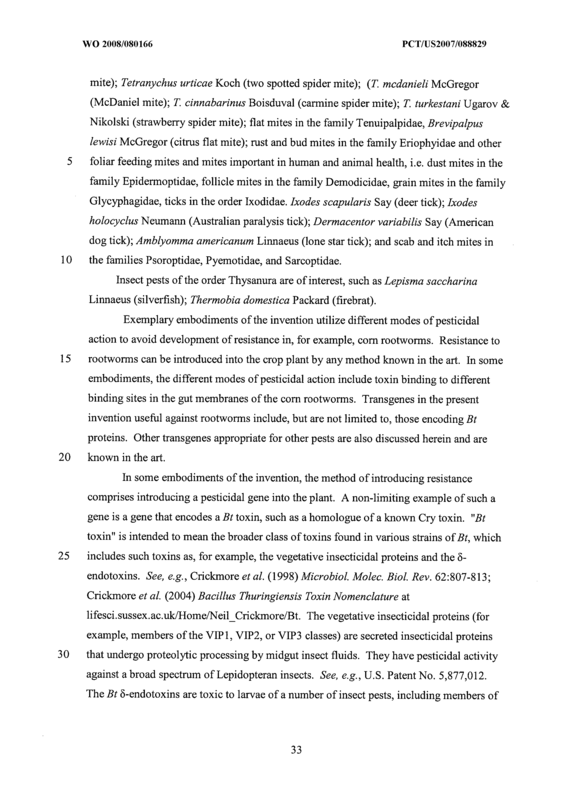 The method of claim 1 , wherein said first transgenic pest resistant crop plant produces a Cryl A(b) protein and said second transgenic pest resistant crop plant produces a Cryl F protein and a Vip3A protein. 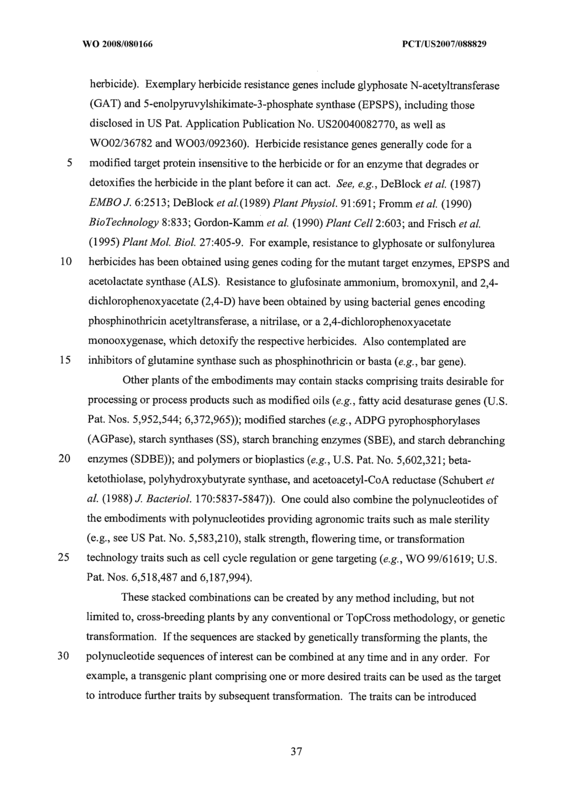 The method of claim 1 , wherein said first transgenic pest resistant crop plant and/or said second transgenic pest resistant crop plant further contains a herbicide resistance gene selected from the group consisting of: glyphosate N-acetyltransferase (GAT), 5- enolpyruvylshikimate-3 -phosphate synthase (EPSPS), phosphinothricin N- acetyltransferase (PAT) or a combination thereof. 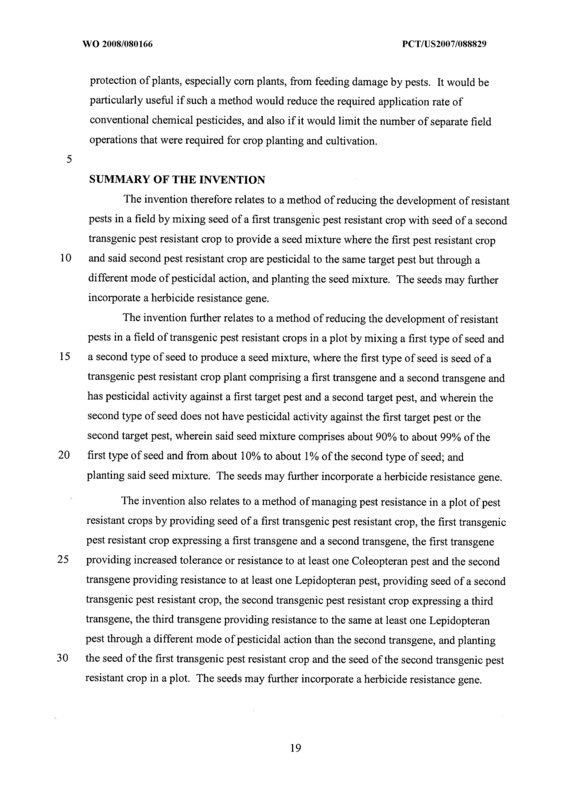 A method of reducing the development of resistant pests in a field of transgenic pest resistant crops comprising the steps of: a) mixing a first type of seed and a second type of seed to produce a seed mixture, wherein the first type of seed is seed of a transgenic pest resistant crop plant comprising a first transgene and a second transgene, the first type of seed having pesticidal activity against a first target pest and a second target pest, and wherein the second type of seed does not have pesticidal activity against the first target pest or the second target pest, wherein said seed mixture comprises about 90% to about 99% of the first type of seed and from about 10% to about 1% of the second type of seed; and b) planting said seed mixture. 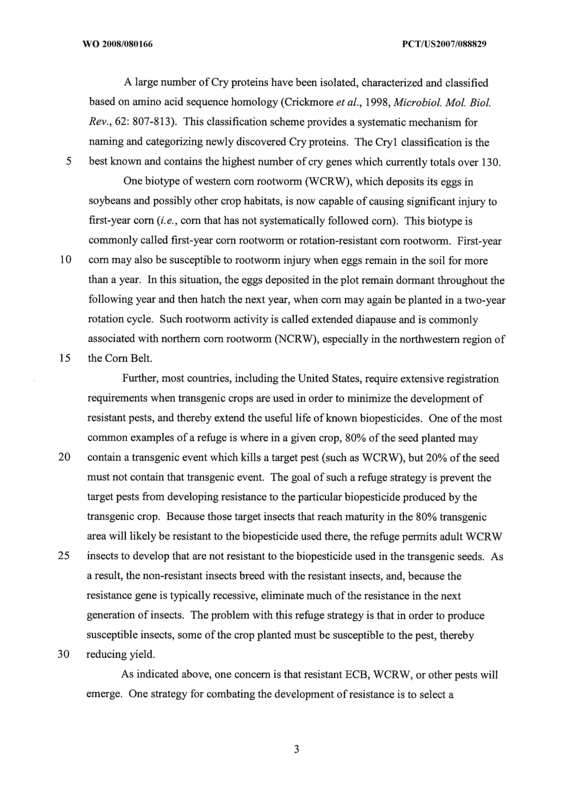 The method of claim 19, wherein said first target pest is selected from the group consisting of: western corn rootworm, northern corn rootworm, Mexican corn rootworm, southern corn rootworm, and combinations thereof. 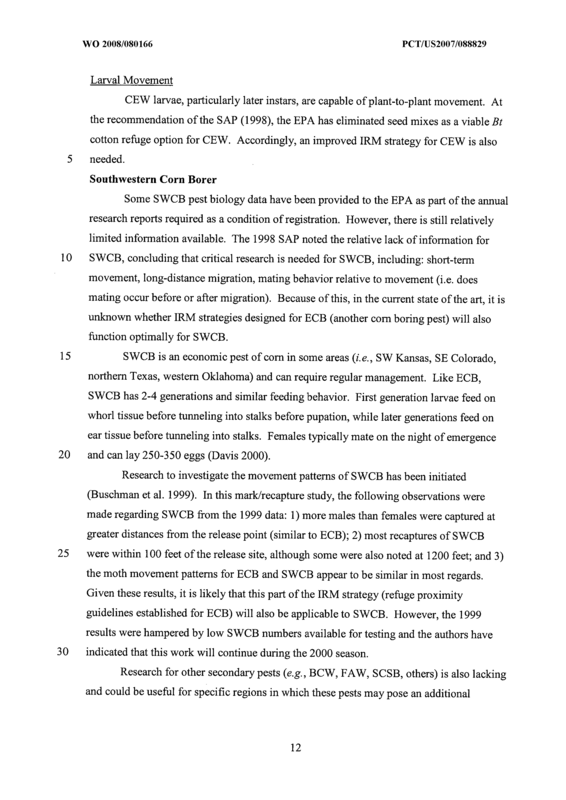 The method of claim 19 wherein said first target pest is western corn rootworm. 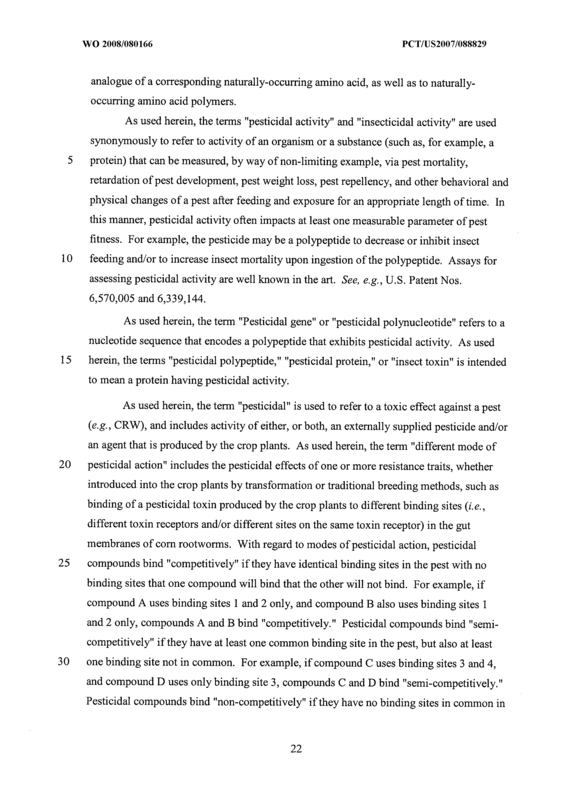 The method of claim 19 wherein the first type of seed is pesticidal to at least one pest through at least two different modes of pesticidal action, the different modes of pesticidal action comprising binding either semi-competitively or non-competitively in the gut membrane of the at least one pest. 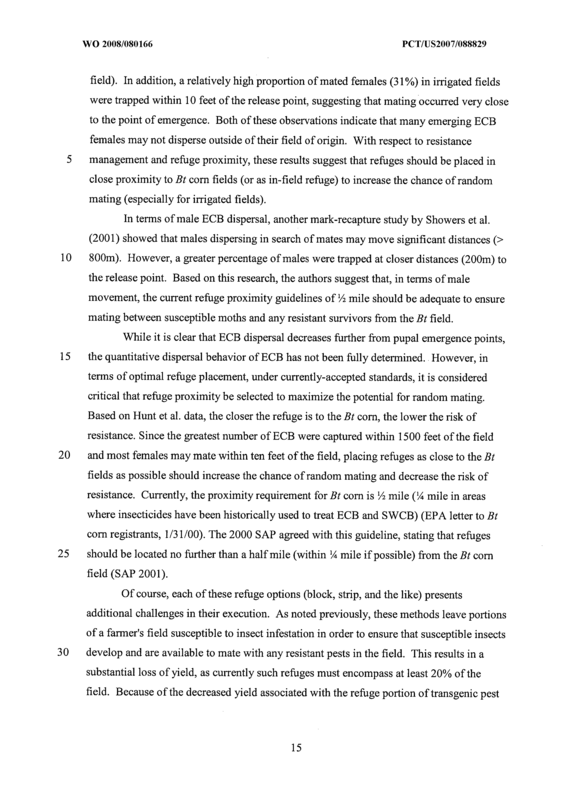 The method of claim 19 further comprising treating the first type of seed and/or the second type of seed with a pesticidal agent. 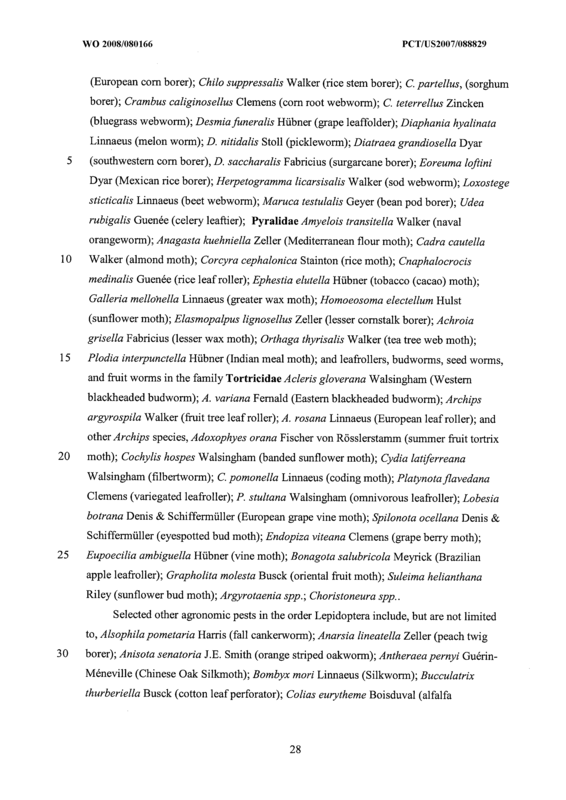 The method of claim 23, wherein said pesticidal agent is selected from the group consisting of pyrethrins and synthetic pyrethrins, oxadizines, chloronicotinyls, nitroguanidines, triazoles, organophosphates, pyrrols, pyrazoles, phenol pyrazoles, diacylhydrazines, biological/fermentation products, and carbamates. 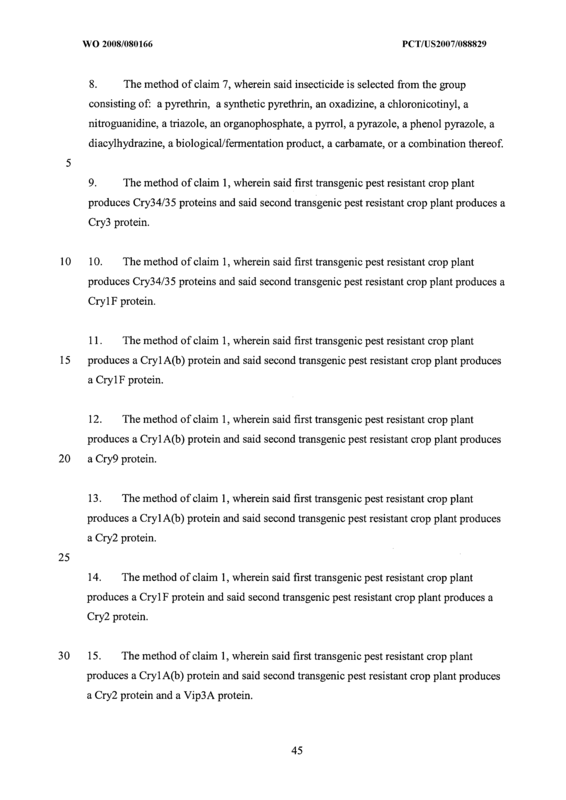 The method of claim 19, wherein the transgenic pest resistant crop plant produces a protein selected from the group consisting of Cry34/35, CrylF, CrylA(b), Cry2, Cry3, Cry9 proteins or combinations thereof. 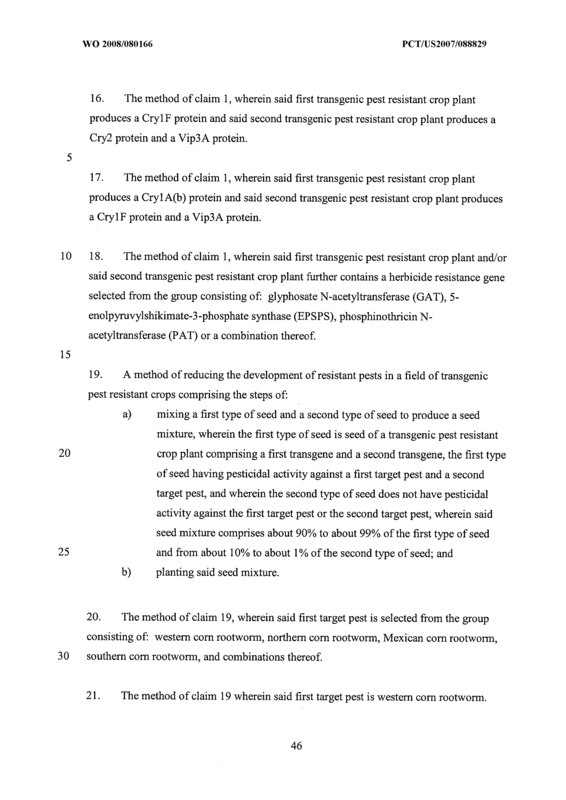 The method of claim 19, wherein the transgenic pest resistant crop plant produces a Cryl F protein and a Cryl A(b) protein. 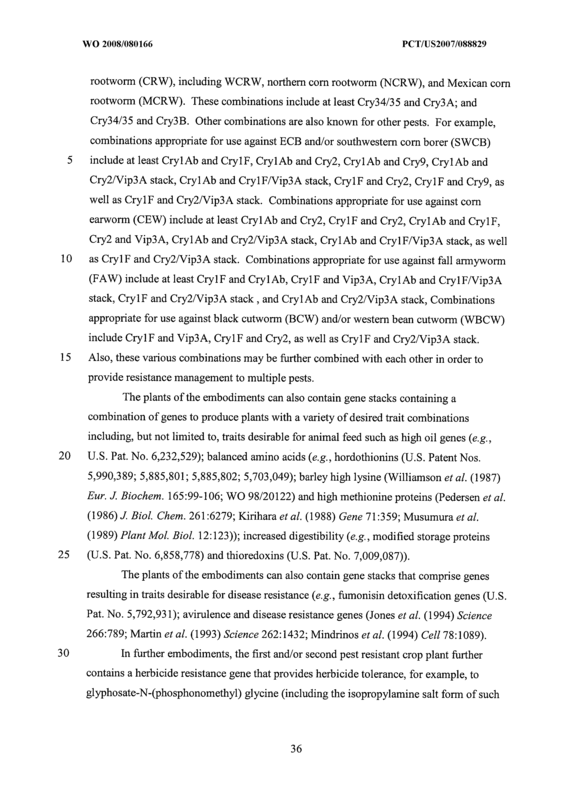 The method of claim 19, wherein the transgenic pest resistant crop produces Cry 34/35 proteins, a CrylA(b) protein, and a CrylF protein. The method of claim 19, wherein said seed mixture comprises about 95% of the first type of seed and about 5% of the second type of seed. 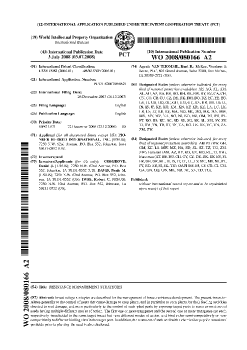 The method of claim 19, wherein said first transgenic pest resistant crop plant or said second transgenic pest resistant crop plant further contains a herbicide resistance gene selected from the group consisting of: glyphosate N-acetyltransferase (GAT), 5- enolpyruvylshikimate-3-phosphate synthase (EPSPS), phosphinothricin N- acetyltransferase (PAT) or a combination thereof. 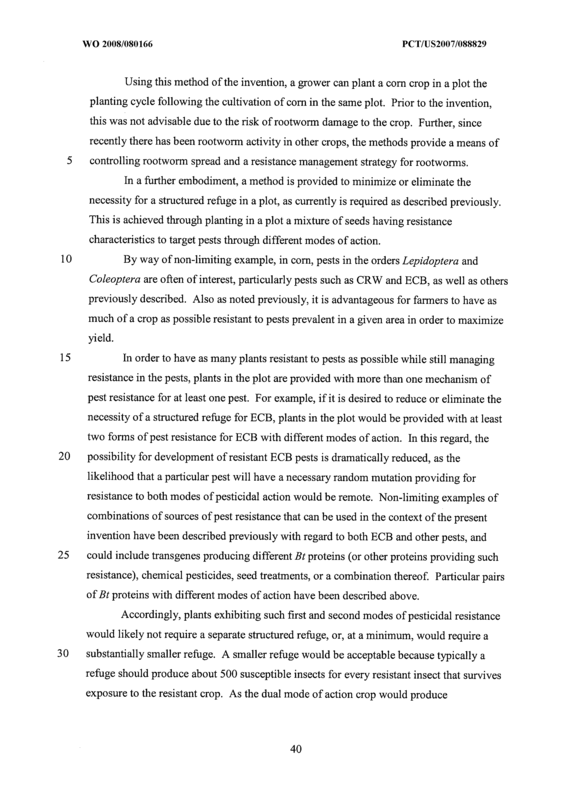 A method of managing pest resistance in a plot of pest resistant crops comprising: a) providing seed of a first transgenic pest resistant crop, the first transgenic pest resistant crop expressing a first transgene and a second transgene, the first transgene providing increased tolerance or resistance to at least one Coleopteran pest and the second transgene providing resistance to at least one Lepidopteran pest, b) providing seed of a second transgenic pest resistant crop, the second transgenic pest resistant crop expressing a third transgene, the third transgene providing resistance to the same at least one Lepidopteran pest through a different mode of pesticidal action than the second transgene, and c) planting the seed of the first transgenic pest resistant crop and the seed of the second transgenic pest resistant crop in a plot. 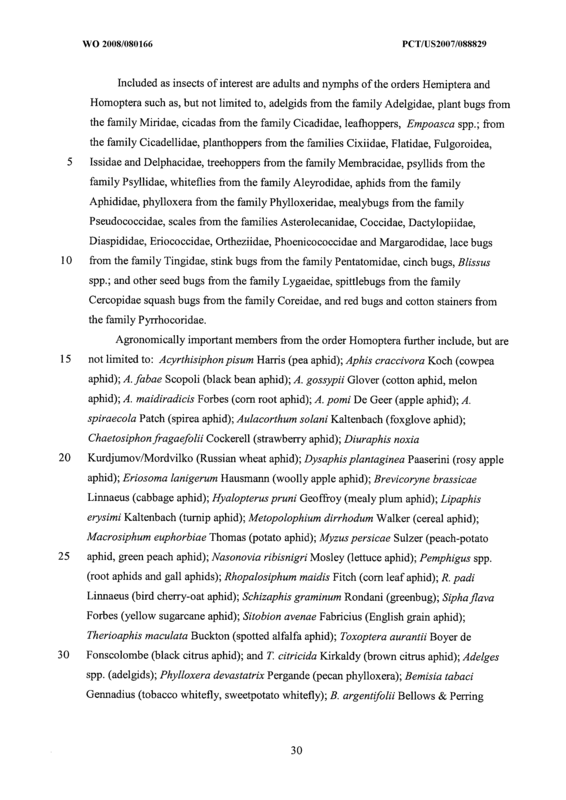 The method of claim 30 wherein the at least one Coleopteran pest is selected from the group consisting of western corn rootworm, northern corn rootworm, Mexican corn rootworm, southern corn rootworm, or combinations thereof. 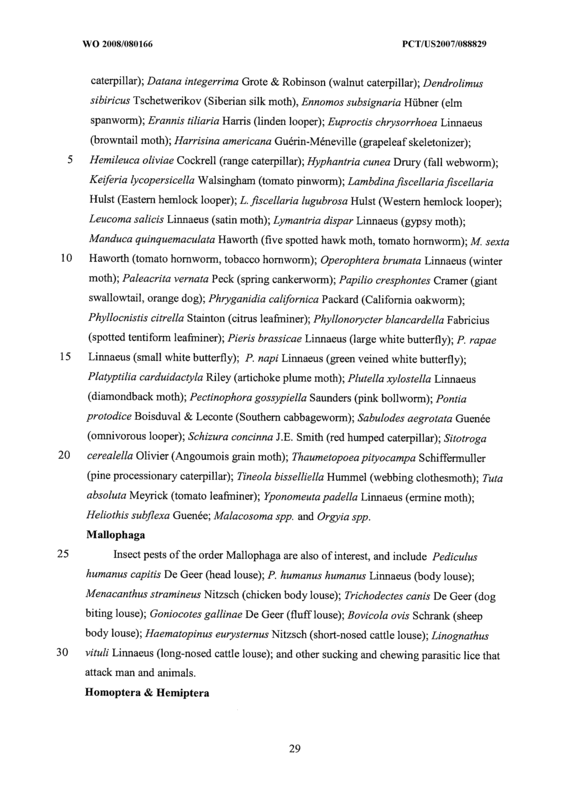 The method of claim 30 wherein the at least one Lepidopteran pest is selected form the group consisting of European corn borer, southwestern corn borer, corn earworm, fall armyworm, black cutworm, western bean cutworm, or combinations thereof. 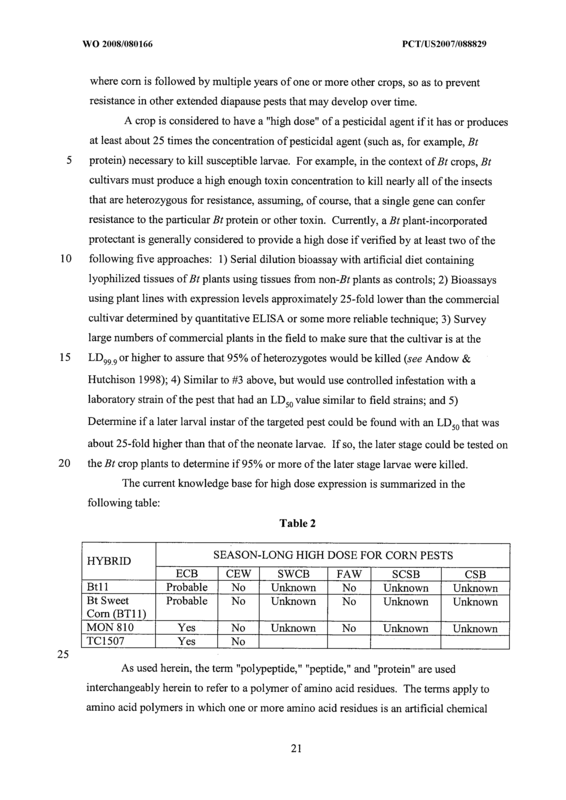 The method of claim 30 further comprising treating said first transgenic pest resistant crop seed and/or said second transgenic pest resistant crop seed with a pesticidal agent. 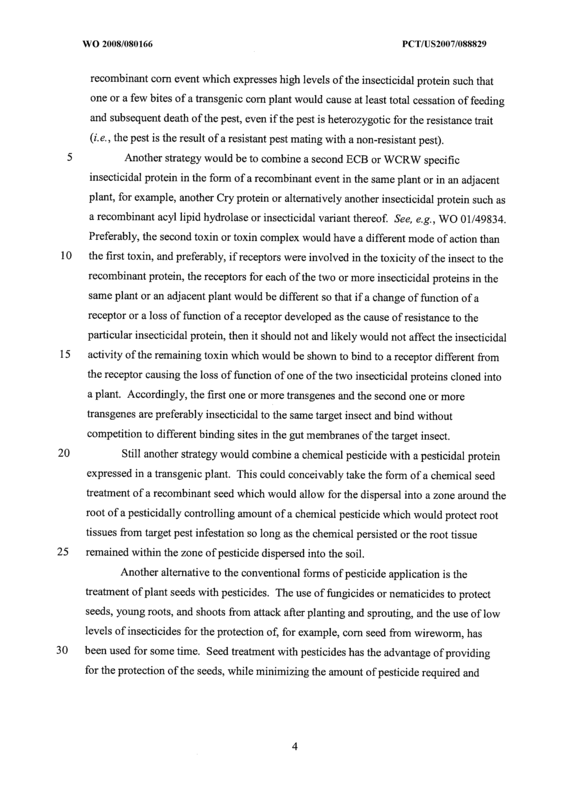 The method of claim 30 wherein said pesticidal agent is selected from the group consisting of: an insecticide, an acaricide, a nematicide, a fungicide, a bactericide, a herbicide, or a combination thereof. 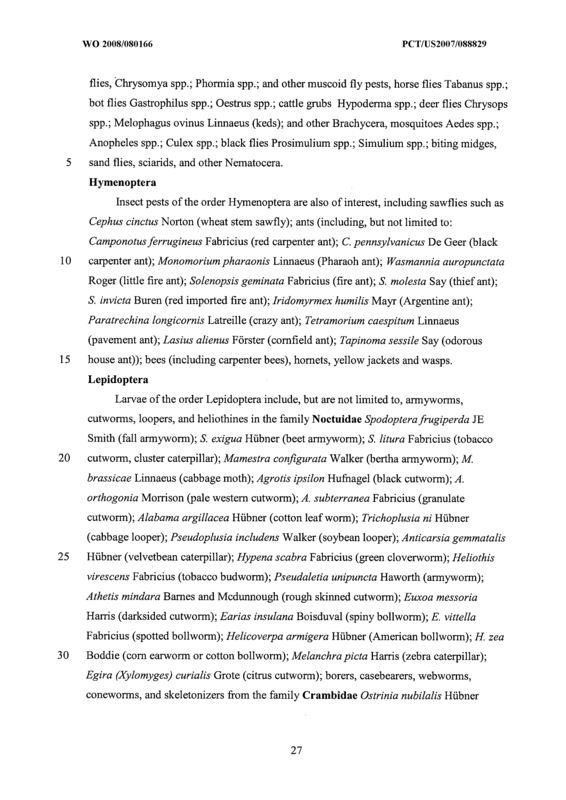 The method of claim 30 wherein said pesticidal agent is an insecticide. 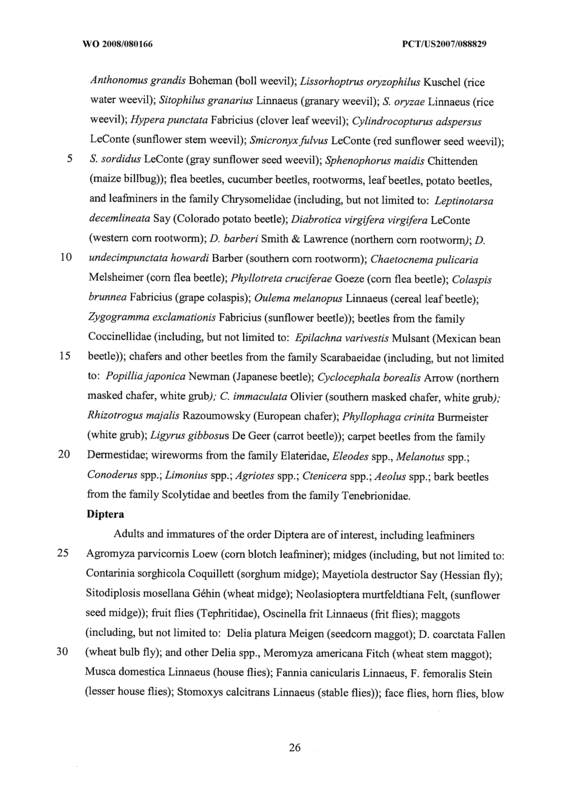 The method of claim 30 wherein said insecticide is selected from the group consisting of: a pyrethrin, a synthetic pyrethrin, an oxadizine, a chloronicotinyl, a nitroguanidine, a triazole, an organophosphate, a pyrrol, a pyrazole, a phenol pyrazole, a diacylhydrazine, a biological/fermentation product, a carbamate, or a combination thereof. 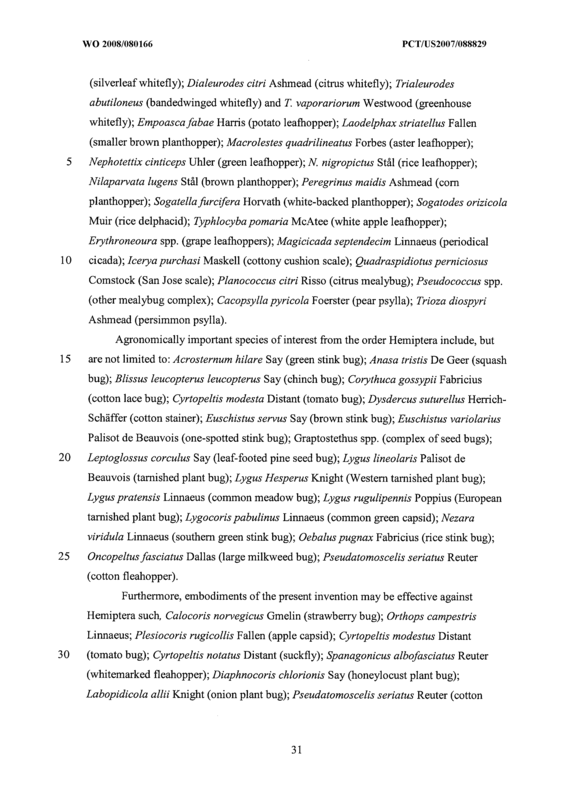 The method of claim 30, wherein said first transgenic pest resistant crop plant and/or said second transgenic pest resistant crop plant further incorporate a herbicide resistance gene selected from the group consisting of: glyphosate N-acetyltransferase (GAT), 5-enolpyruvylshikimate-3-phosphate synthase (EPSPS), phosphinothricin N- acetyltransferase (PAT) or a combination thereof. 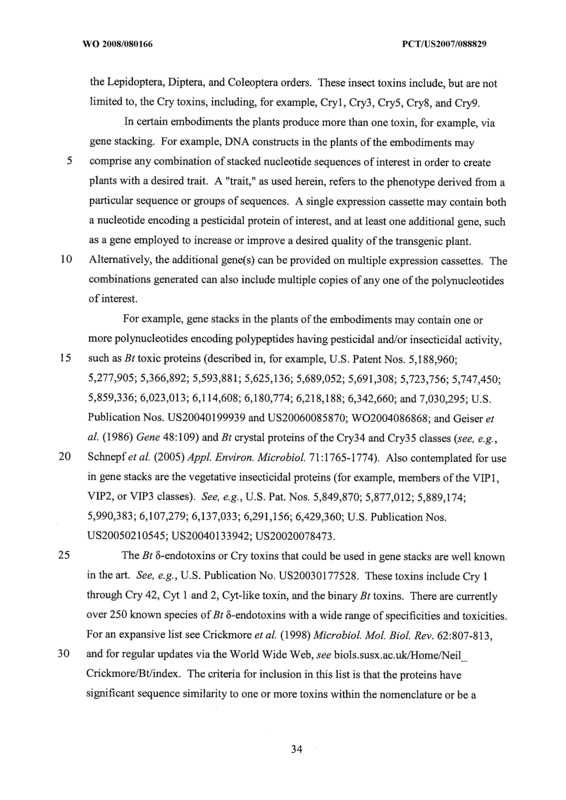 The method of claim 30 wherein expression of the first transgene causes expression of Cry34/35 proteins in a plant. 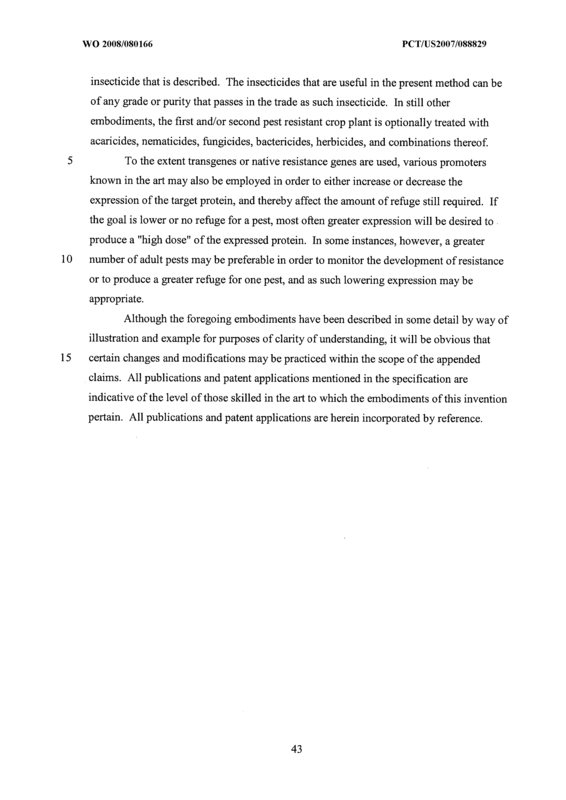 The method of claim 30 wherein expression of the second transgene causes expression of a Cry IF protein in a plant. 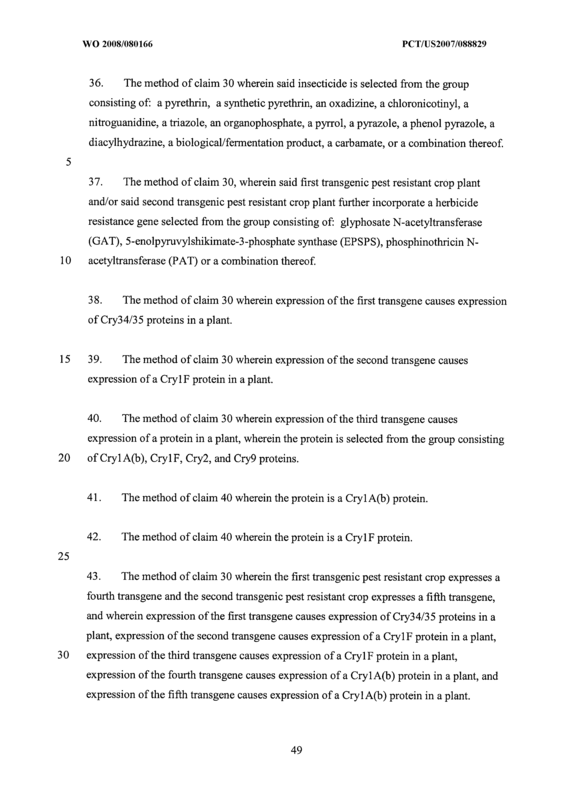 The method of claim 30 wherein expression of the third transgene causes expression of a protein in a plant, wherein the protein is selected from the group consisting of Cry 1 AQo), Cry 1 F, Cry2, and Cry9 proteins. 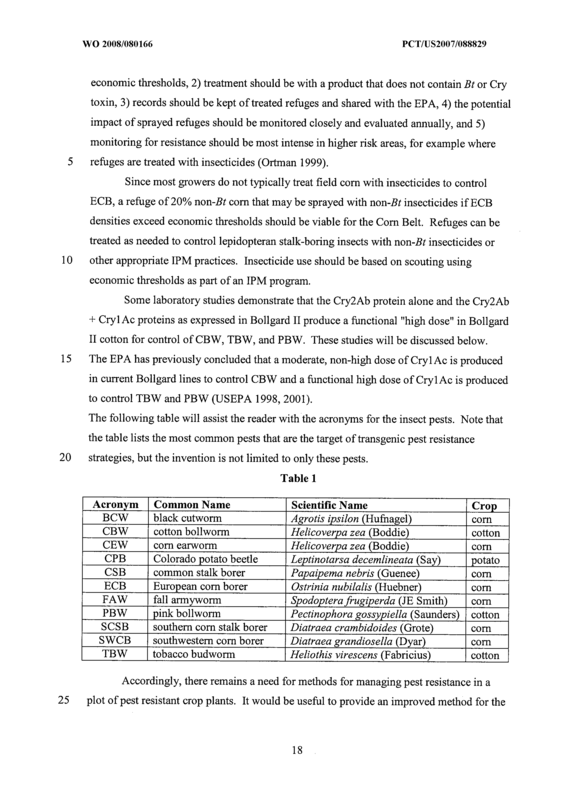 The method of claim 40 wherein the protein is a Cry 1 A(b) protein. 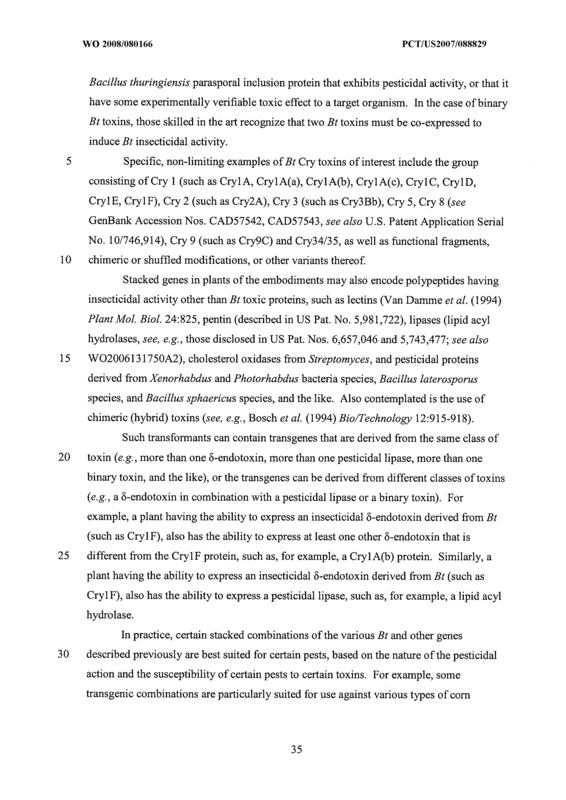 The method of claim 40 wherein the protein is a Cry 1 F protein. 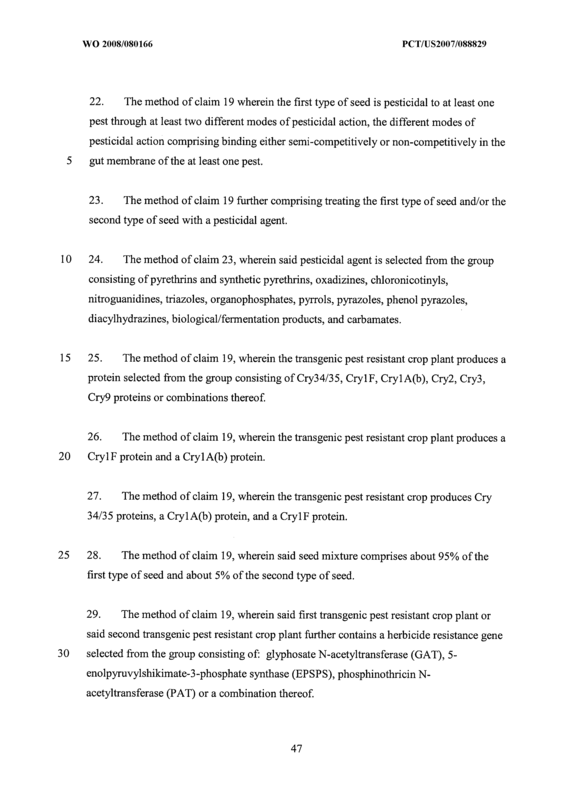 The method of claim 30 wherein the first transgenic pest resistant crop expresses a fourth transgene and the second transgenic pest resistant crop expresses a fifth transgene, and wherein expression of the first transgene causes expression of Cry34/35 proteins in a plant, expression of the second transgene causes expression of a Cry IF protein in a plant, expression of the third transgene causes expression of a Cry 1 F protein in a plant, expression of the fourth transgene causes expression of a CrylA(b) protein in a plant, and expression of the fifth transgene causes expression of a Cryl A(b) protein in a plant. 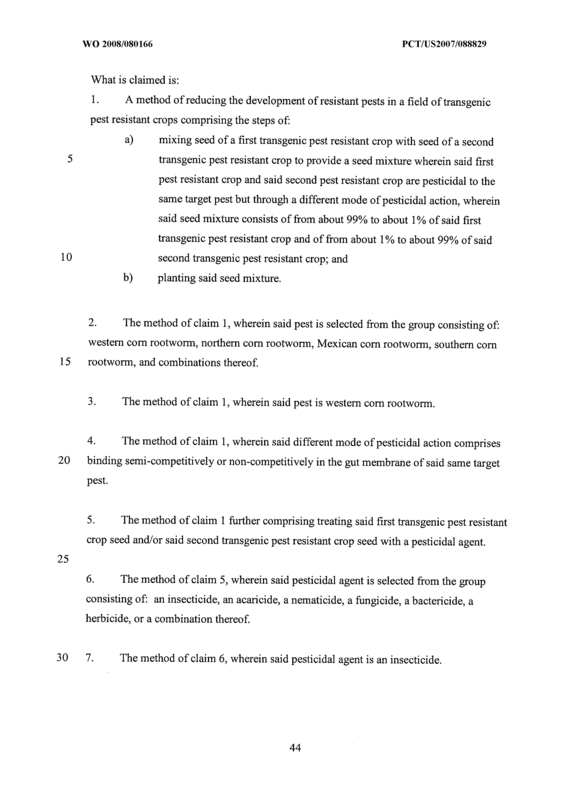 The method of claim 43 wherein the seed of the first transgenic pest resistant crop comprises at least about 90% of the total crop planted in the plot. 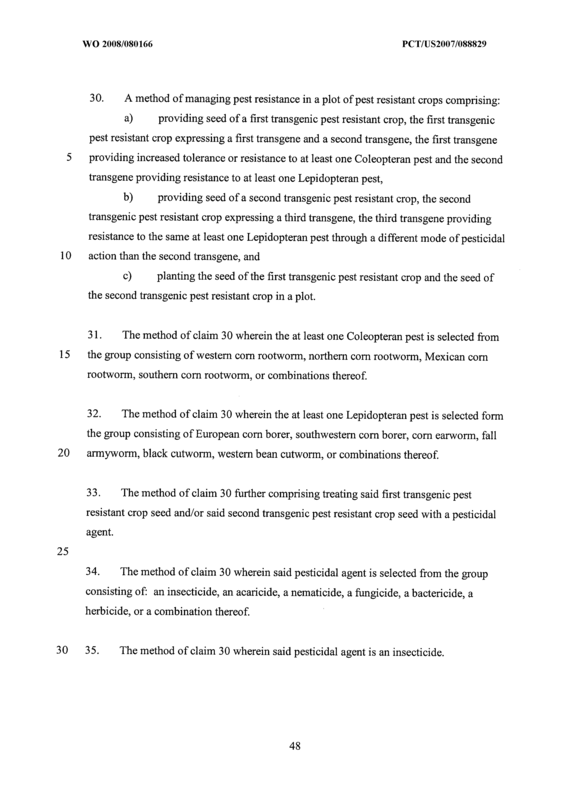 The method of claim 30 further comprising: providing seed of a third transgenic pest resistant crop, the second transgenic pest resistant crop expressing a fourth transgene, the fourth transgene providing resistance to the same at least one Coleopteran pest, but not providing resistance to the same at least one Lepidopteran pest. 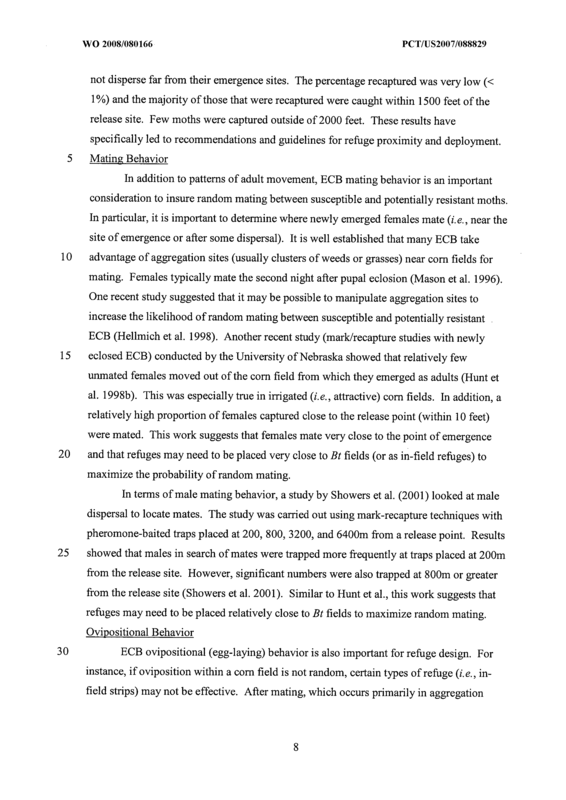 The method of claim 45 wherein the fourth transgene and the second transgene comprise the same transgene. 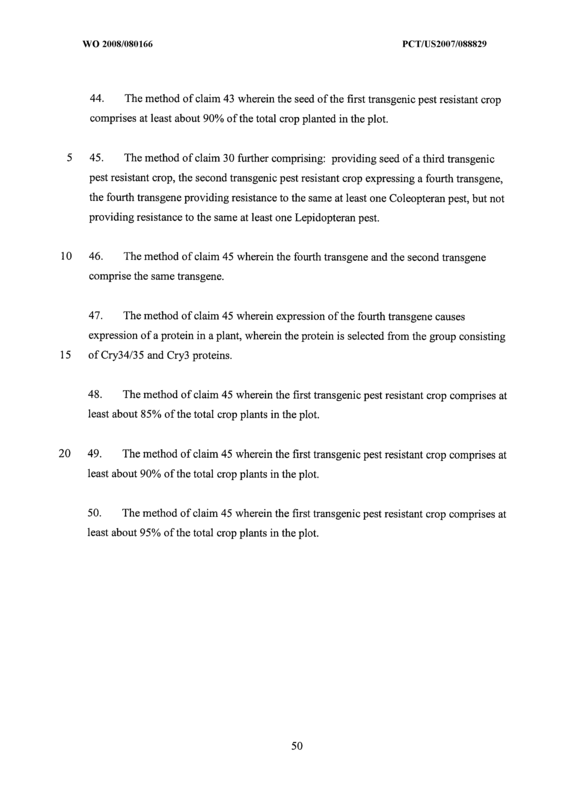 The method of claim 45 wherein expression of the fourth transgene causes expression of a protein in a plant, wherein the protein is selected from the group consisting of Cry34/35 and Cry3 proteins. 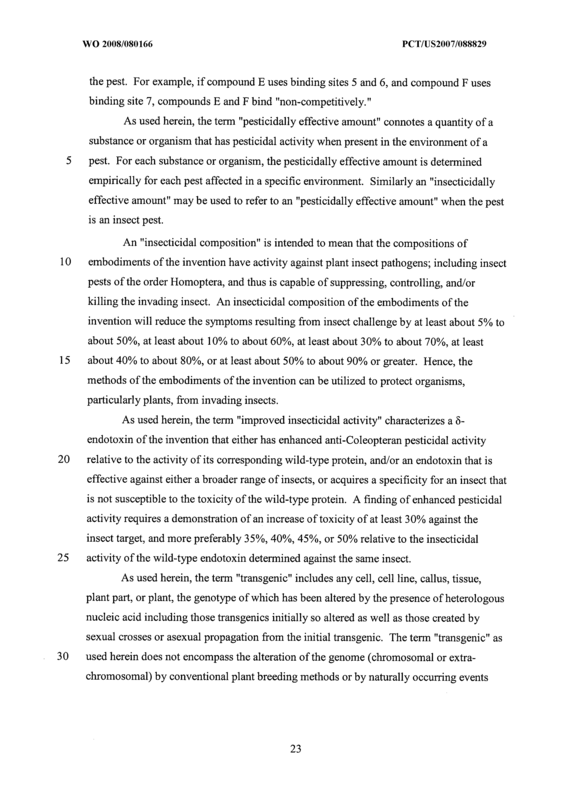 The method of claim 45 wherein the first transgenic pest resistant crop comprises at least about 85% of the total crop plants in the plot. 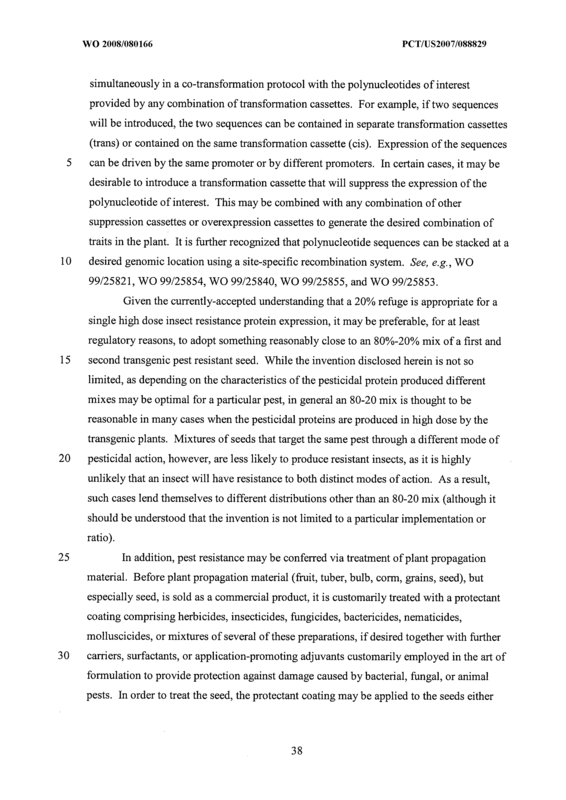 The method of claim 45 wherein the first transgenic pest resistant crop comprises at least about 90% of the total crop plants in the plot. 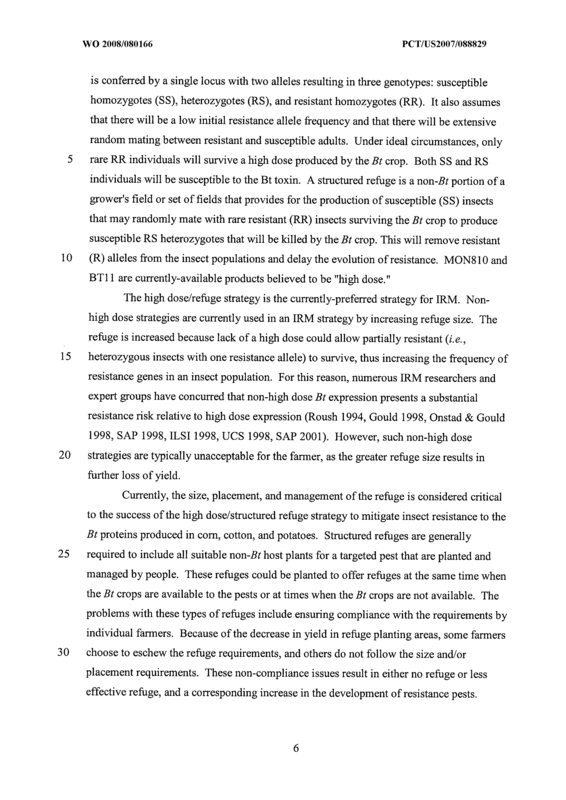 The method of claim 45 wherein the first transgenic pest resistant crop comprises at least about 95% of the total crop plants in the plot.